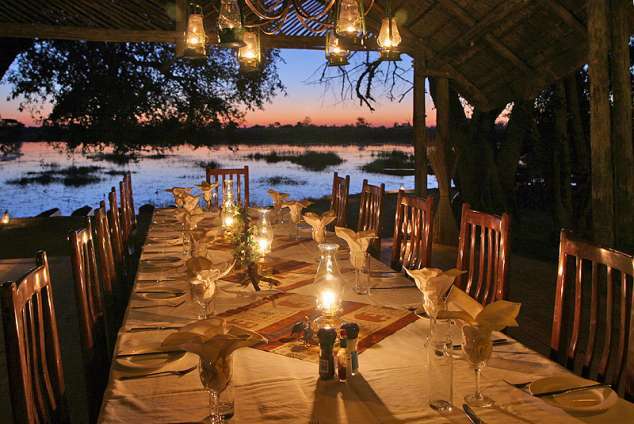 Pom Pom Camp - Okavango Delta Accommodation. In the heart of the Okavango Delta within the MATSEBE concession area, Pom Pom camp is another jewel in Botswana's crown! Here hippo grunt and frolic in front of camp that is surrounded by miles of reeds. In a clear water oasis "makoro's" offer you a wonderful means of viewing wildlife as you glide between palm fringed islands. An 18 - bedded safari camp, built and designed in the style of safari camps of old. The camp overlooks a scenic lagoon and is quietly nestled under a grove shady trees. The camp has 9 large walk-in tents, all with en suite showers, flush toilets and although roofless, the bathrooms are enclosed for privacy, security and importantly offer you a truly unique bush adventure. This is a camp for the safari traditionalist! Camaraderie prevails around a camp fire each night as bushlore anecdotes are recounted whilst a gracious meal is prepared and elegant wines uncorked. Over hot coffee and perhaps a fine cognac, you will re-live the day's events and compare notes on fishing and photography - and of course plan for another day that will be remembered long after your return to civilization. In the main thatched building you will find a cozy bar, lounge and table settings for imaginative meals prepared by our safari chefs. Our camp staff are proficient at their skills and will give you advice, suggestions and help during your stay. They will also give you a warm welcome at the end of each day. There is the possibility of seeing numerous different species of game, however Pom Pom is also about the nature experience as much as anything else. In addition to big game, Pom Pom is a bird-watcher's paradise and within a maze of water passages you will find the busy Pied King Fisher and countless other birds that flourish in the water ways. One such bird is the African Jacana, or commonly known as the "Lilly Trotter" which, with it's long sticklike leg's runs along the top of lily pads without causing so much as a ripple! And... for your comfort, game drives are offered in new, luxury open-viewing land cruisers, with a tracker and a driver / guide. 14539 page views since 15 May, 2008. Last updated on 07 Nov, 2017.